Welcome! Your future is calling at Edmonds Community College. A college education increases your opportunities and future earning potential — and it’s an inspiring experience. study abroad in Australia and New Zealand, Barcelona and Pamplona, Spain; Beijing, China; Berlin, Germany; Costa Rica; London, England; Lyon, France; Nagasaki and Tokyo, Japan; Rabat, Morocco; and Taiwan. Our college supports students studying science, technology, engineering, and math (STEM). 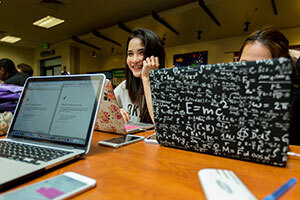 Our programs include computer science, digital forensics, engineering, and engineering technology, as well as Associate in Science transfer degrees with five areas of specialty — programs that provide great preparation for continuing studies at a university. Technical degrees and certificates offer skills that help you get employers’ attention, earn higher wages and pay for your education. Train for jobs in health care, culinary arts, construction, paralegal, or a variety of other fields.